Researchers from Yokohama National University and the University of Tokyo in Japan have developed a new ion gel that has enhanced toughness and self-heals at ambient temperatures without an external trigger, which they believe could be the future building block of flexible electronics. According to a report from the universities, ion gels have become a popular topic of study because they do not evaporate at room temperature, have high thermal stability, and high ionic conductivity. This new gel has multiple hydrogen bonds, which improves the material’s toughness. The ion gel is filled with salts in liquid form (ionic liquids) and was created using a diblock copolymer, which is the combination of a material that is repelled by ionic liquids and a second that bonds with hydrogen. 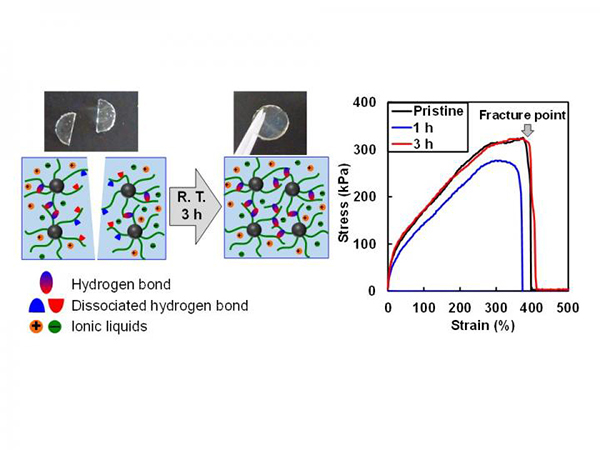 Because hydrogen bonding is reversible, the material is self-healing and can be repaired in only a few hours. The researchers found that the healing process did not alter the gel’s mechanical or electrochemical properties. “Ion gels, composed of macromolecular networks filled by ionic liquids (ILs), are promising candidate soft solid electrolytes for use in wearable/flexible electronic devices. In this context, the introduction of a self?healing function would significantly improve the long?term durability of ion gels subject to mechanical loading. Nevertheless, compared to hydrogels and organogels, the self?healing of ion gels has barely investigated been because of there being insufficient understanding of the interactions between polymers and ILs. “Herein, a new class of supramolecular micellar ion gel composed of a diblock copolymer and a hydrophobic IL, which exhibits self?healing at room temperature, is presented. The diblock copolymer has an IL?phobic block and a hydrogen?bonding block with hydrogen?bond?accepting and donating units. “By combining the IL and the diblock copolymer, micellar ion gels are prepared in which the IL phobic blocks form a jammed micelle core, whereas coronal chains interact with each other via multiple hydrogen bonds.